How many of you develop in Visual Studio Tools for Microsoft Dynamics GP? How many of you ran into an 'issue' after displaying your own .NET modal window? For the longest time I had been trapped in my own Microsoft Dexterity development shell and could not see why anyone would want to integrate to Dynamics GP with anything that is not Dexterity -- I am not referring to simple customizations here! After all, Dexterity is (and will continue being for years to come!) the native development environment of Dynamics GP. So, the next obvious question in my mind was, why couldn't .NET developers learn Dexterity? After all, we were here first! But, then I decided to spin the question around, why couldn't Dexterity developers learn .NET? Now, that's a challenge I like!! In the next 2 weeks I will publish a set of articles showing Dexterity developers that it is possible to make a relatively smooth transition to .NET development with Visual Studio Tools for Microsoft Dynamics GP -- by far, the longest name for any Microsoft product, so we will shorten that to VST. Developers using Visual Studio Tools for Microsoft Dynamics GP with forms that contain scrolling windows might have noticed that the LineFill events are missing from v9.0 and v10.0, this posting explains why they were missing and why they have been added back. Dexterity can display multiple records from a table at one time using a scrolling window. Scrolling windows are used in lookup windows and many enquiry windows in BrowseOnly mode and also in transaction windows which have lines or distributions in AddsAllowed mode. Scrolling windows have six events associated with them, these are the LinePre, LineChange, LinePost, LineFill, LineDelete and LineInsert events. Dexterity can register triggers before and after the original scripts of these six events. In Visual Studio Tools, we have the LineEnter, LineChange, LineLeave, LineDelete and LineInsert events that we can select to run BeforeOriginal or AfterOriginal, but there are no LineFill events. Where did the LineFill events go? I was recently asked by another consultant to quote a modification that would give users advanced notice before their GP Password was going to expire. This customer was growing frustrated that their user's passwords were expiring without notice and IT was having to reset them frequently. The typical work around is to change your GP Password when you change your network password but that wasn't good enough in this instance. The customer ended up choosing to go with one of the ISV solutions instead of a custom solution for additional features but I went ahead and finished this in my "spare time" anyway. I've been doing a lot of work with Visual Studio Tools lately and find myself migrating more towards that from VBA. VSTools is not a replacement for VBA but in some cases can prove to be a more effective tool. This is a post about a very obscure topic that I normally would avoid, but since I spent the last several days dealing with it, I thought I would share the love. 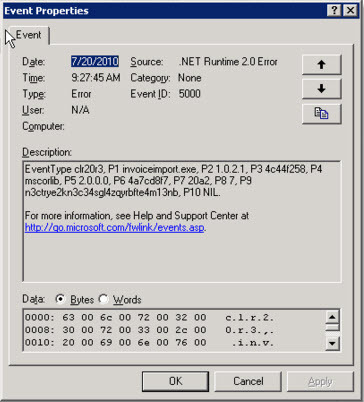 If I ran into this problem with a very simple .NET eConnect integration, anyone could run into it. I recently deployed three eConnect 9 imports at a client site, just like I've done with dozens and dozens of .NET eConnect integrations. The client uses Citrix, and has two load balanced application servers for Dynamics GP. To install my three imports, we had to install them on both of the Citrix servers. The installs went fine, the apps all appeared to work well, and I thought my work was done. Until the key business user launches one of the imports and gets an error. The app doesn't launch, no windows appear, she just sees a "crash" error message. After further testing, we find that the app launches fine on Citrix server #1, but gives her the error on Citrix server #2. Exact same app. I then check Event Viewer and see some arcane error messages related to the application crash. They are basically generic .NET errors that don't provide any guidance as to the cause of the crash. After reading many blog posts, TK articles, forum threads, and the like I pieced together from many sources how to build Visual Studio Toolkit forms that integrate with Dynamics GP security so you don't have to hard code a connection string or any environment specific settings in your application or .config file. I am excited to be deploying a customization I recently wrote leveraging the Visual Studio Toolkit for GP and eConnect to production this week. This purpose of publishing this real world example is to demonstrate the value of extending your GP solution with the Visual Studio Toolkit and provide a basis for future posts on the subject. For the last year or so, I have exclusively used GP and Visual Studio on virtual servers, and after wiping my laptop to install Windows 7, never bothered to reinstall GP, SQL, or Visual Studio. Since I nearly always have internet access on my laptop through WiFi or my 3G card, I've always been able to login to my servers remotely and work on GP on a server. But I had a flight recently and wanted to work on a prototype of a new GP add-on, so I installed GP 10 on my laptop so that I could work during the flight.